Everyone loves street food and I am no exception. My occasional cravings take us to Mumbai Masala in Norcross where we tuck in to the best chaat in Atlanta, or so my inner persnickety Bombayite street food lover thinks. Mumbai Masala serves the usual routine that includes bhel puri, sev puri, ragda patties, pani puri and other delicious goodies. The food is cheap, fresh and flavorful. Actually, let me rephrase: it is fresh, flavorful and cheap. Sometimes it is a little too fiery for my sensitive taste buds but for most part, Mumbai Masala is my favorite, hands down, when it comes to Indian chaat in Atlanta. And this site bears testimony to that. Just check out the number of posts I have dedicated to this little eatery in Norcross! Enough about Mumbai Masala; this is a post about Naanstop. I heard about Naanstop many months ago, but given that it is located in Downtown and I neither work nor live in the neighborhood, I didn’t get a chance to visit until this week. T and I decided to go out for lunch and I thought we could go check out Naanstop, and so, off we went. Parking is a hassle in Downtown, as anyone will tell you. So we drove around the block, trying to find a place to park T’s car. When we found one, T realized that she didn’t have any quarters for the parking meter. I had a few and I fed those to the machine. I asked some of the stores around if they could give me loose change but everyone looked at me as if I was asking them for a kidney! Not very welcoming… until I walked into Dania’s Restaurant where the nice young guy behind the counter happily gave me $2 in quarters. Thanks, thanks! 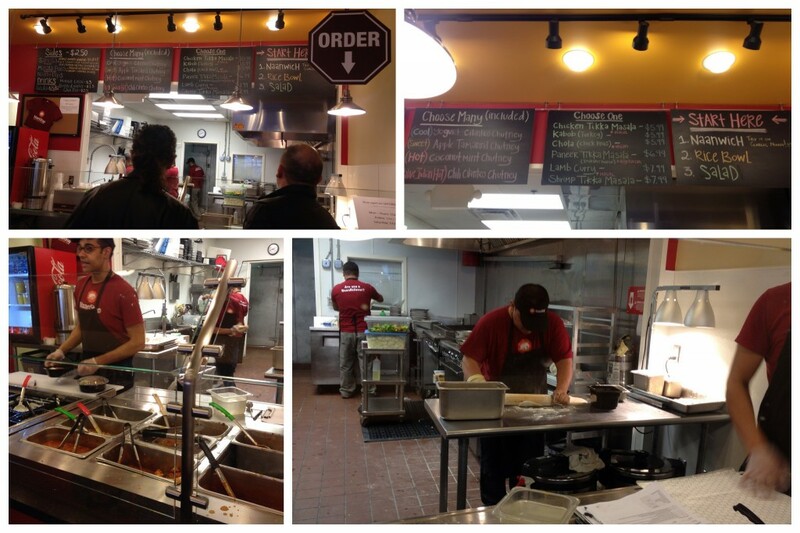 Finally, we got to Naanstop, a little place on Broad Street, busy and cheerful. The menu is limited and there are only a couple of vegetarian options. It isn’t exactly Indian street food although a few of the items can be easily categorized so. Naanstop’s invention, the Naanwich (think of a pita wrap that uses a Naan instead) is a handy invention and it nicely fits in all manner of fillings and sauces. 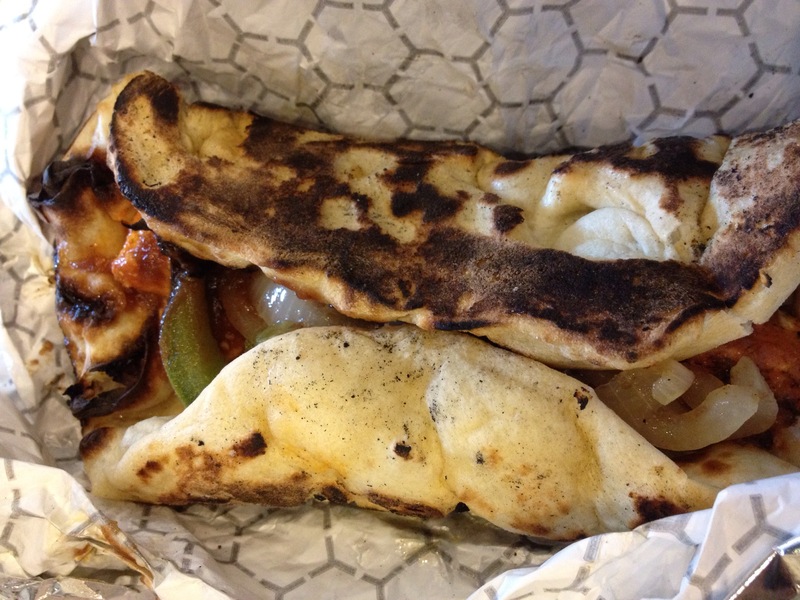 I asked for a Naanwich with garlic Naan, Paneer Tikka Masala filling, grilled vegetables and apple-tamarind chutney. Lucky me, I got a piping hot Naan, fresh from the Tandoor, crisp and crackling. I also got a chance to see how it is made. Wish I had taken some pictures. Anyway, the Tandoor is a large pot (of stone?) with a hole at the top. The Naan dough is rolled out, a fistful (or lesser) of minced garlic is added in, and then the Naan is put inside the Tandoor, poked around with a long stick, then taken out when nicely done. You will know when it’s done, I suppose, by the toasty fragrance that fills the air. The garlic gains a slightly charred flavor, losing its sharpness, turning mild. The Paneer Tikka Masala filling was perfectly spiced, red in color. I wish Indian restaurants would stop using red food coloring; the food wouldn’t taste/look any lesser, I am sure! The apple-tamarind chutney was sweet-sour, a perfect foil to the creamy paneer, and the grilled onions/peppers provided a nice crunch to the filling. 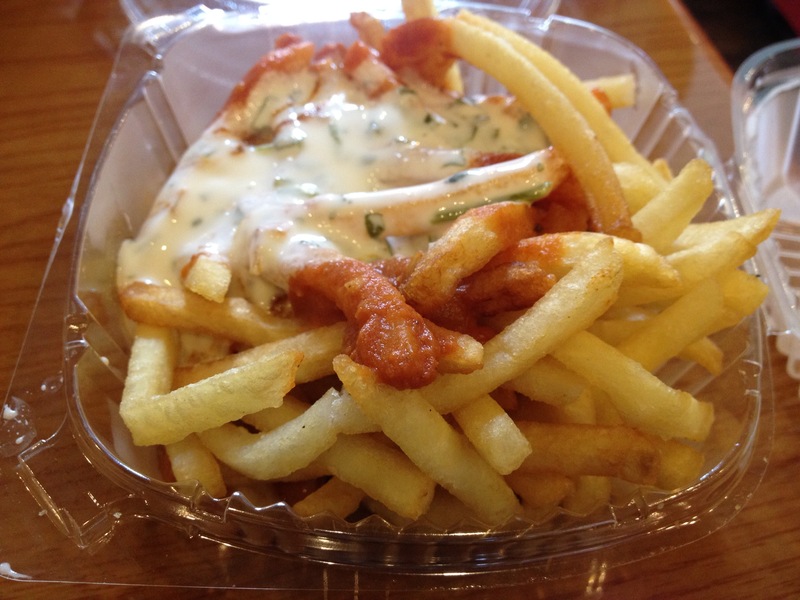 I also ordered a side of fries topped with Tikka Masala and Yogurt-Cilantro Chutney. This is a BIG side, almost half a meal. Lucky for me that T was there, so we could share it. This dish is a new invention, an Indian-American fusion item and I liked it… well, a little. The chutneys turned the fries soggy in minutes and I had to throw most of them… sigh. Another vegetarian filling option is Chhole (chickpeas in tomato-spices sauce, for want of a better description). You can get either that or the Paneer Tikka Masala filling over basmati rice as well. I wanted to sample the Garlic Naan, so I picked the Naanwich instead. A little detail that annoyed me a little… I noticed one of the guys behind the counter checking the temperature of the food with a thermometer. He stuck it into one of the fillings (chicken, perhaps), took it out, read the temperature. He then rinsed the thermometer in a little plastic bowl of water (that didn’t look too clear, really), then stuck it into another container. I asked him about it and he explained, (a little apologetically, I thought) that he was rinsing the thermometer between sticking it into different fillings. Looked like a situation ripe for cross-contamination issues, hmmm. Anyway, I would love to go back to Naanstop and I would love for them to have more vegetarian options. Some ideas that come to mind: Potato Patties with Date-Tamarind Chutney, Naanwich filled with Palak/Saag Paneer, Basmati Rice Bowl with Rajma, Basmati Rice and Dal Tadka with a side of lime pickle… A list of delicious possibilities comes to mind!